The Yamal-Nenets Autonomous Area has the most affordable gasoline prices in Russia, according to a RIA Rating study. Experts have calculated how much 92-octane gas Russians can buy with an average salary. The average figure was 896 liters. Residents of the Yamal-Nenets Autonomous Area can afford the highest volume, up to 2,000 liters of gas per month. Muscovites can only buy 1,699 liters, and residents of the Nenets Autonomous Area, 1,588 liters, RIA Novosti reports. Dagestanis seem to be the least privileged, as they can refuel only 483 liters per month, while in Karachayevo-Circassia and Kabardino-Balkaria, 508 and 517, respectively. In Kalmykia, filling up is slightly more affordable – a person with average income can afford 531 liters per month; in Crimea, 533. According to the experts, gasoline prices vary greatly across Russia’s regions, from RUR 42 ($0.64) to RUR 59 ($0.90) per liter. It is predictably more expensive in Chukotka, the Magadan region, and Yakutia due to the complicated logistics in these regions in the winter. Regions with the cheapest gasoline are scattered about Russia – Ingushetia, the Chelyabinsk Region and Yamal. 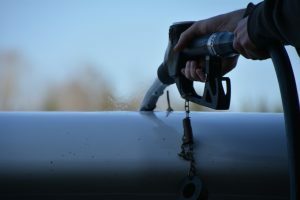 According to experts, the cost of fuel depends on many factors, including logistics – the farther the region is from where the fuel is produced, the more expensive it is. Other factors include the cost of gas station lease and the level of people’s income in the region.